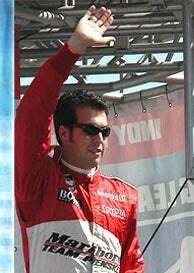 Dan Wheldon, Scott Dixon and Sam Hornish, Jr. A podium finish for Hornish — our man Wert's fast-driving doppelg nger — not to mention a championship for the Indianapolis 500-mile champ and his boss Roger Penske. Congrats to Sam and Roger, not to mention more incentive for Ray to walk around the Detroit Metro area in a Marlboro-emblazoned firesuit. Oh, also, Michael Schumacher announced his end-of-season retirement today, but we figured you probably already knew that.